(Nanowerk News) In 1928 the British physicist Paul Dirac put forward one of the fundamental equations that we use today to mathematically describe a spin ½ particle from a relativistic point of view.The mathematical representation that Dirac came up with enables certain particles, including the electron, to be better understood.Nevertheless, much more remains to be discovered. For the case of particles like electrons that move at great speed, it is very important that the equation that describes them should bear in mind the contribution of the theory of relativity, since at high speeds the effects of this theory become clear.Although Schrödinger had previously discovered an equation that describes the movement of the electron, his equation does not take the theory of relativity into consideration. Naiara Arrizabalaga The complexity of the structure of Dirac's equation makes it very difficult indeed to study it. "There are fewer pieces of work on Dirac's equation than on other equations on partial derivatives like, for example, that of waves or that of Schrödinger", says the mathematician Naiara Arrizabalaga. "It has a very complicated structure.Just as the equations that describe heat or waves are written as a single equation in partial derivatives, the Dirac one is a system of four equations related to each other.This is because the operator associated with the Dirac equation is a differential matrix operator." Arrizabalaga's PhD thesis has studied Dirac's relativistic equation for the precise reason that few pieces of work have been done on it.Specifically, the thesis has set out to study the self-adjoint extensions of the Dirac operator with different potentials, including the electromagnetic potentials with singularity at the origin, using inequalities of the Hardy-Dirac type for this purpose. There is one condition in particular that must be met so that the Dirac equation has a solution and that this solution is the only one:the operator associated with the equation must be self-adjoint, in other words, it must be symmetrical and its domain must coincide with that of its adjoint.In the cases in which it is not possible to prove that the operator is self-adjoint in a certain domain, then it is interesting to build self-adjoint extensions. Arrizabalaga has studied what these extensions have to be like when the Dirac equation is applied to different potentials. 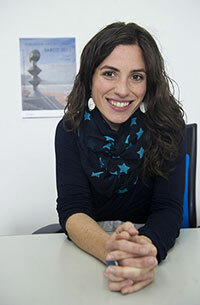 "The Dirac equation is based on a physical reality which is the movement of certain particles.But in the reality around us these particles are not alone, they interact with others and are under the influence of electromagnetic fields," says Arrizabalaga.And that is why she has studied the Dirac operator with electrical and magnetic potentials.The first part of the thesis deals with diagonal electrostatic potentials, and the second tackles more general electromagnetic potentials that have a Coulomb-type singularity. The construction of the self-adjoint extensions for all the potentials studied are related to Hardy-Dirac type inequalities, which are proven in this same piece of work and which are of independent interest owing to the methods involved in the demonstrations and the different uses they have. Another interesting aspect about the Dirac equation is that it can be understood as a dispersive equation, in other words, it describes a wave system that is dispersed in time and space.This is why the equation meets certain dispersive estimates.The thesis has concentrated specifically on Strichartz estimates.Counterexamples are builtin the last part of the thesis for the Strichartz estimates for the Diracmagnetic equation, and what is more, counterexamples have been found for the wave equation. In short, the thesis has striven to further certain mathematical methods that allow progress to be made in resolving the Dirac equation.What is more, it is believed that the methods created in this piece of work will be of use in other equations. Naiara Arrizabalaga (Amorebieta-Etxano, Basque Country, 1983). She is a PhD holder in mathematics.Her research group routinely works with equations in partial derivatives like the Schrödinger one, the Helmholtz one, etc., but her thesis is one of the group's first studies of the Dirac equation.The thesis was developed over four years under the supervision of Professors Javier Duoandikoetxea and Luis Vega González.